1. Place the grated courgette into a colander and add one teaspoon of sea salt, give this a mix. Place the colander over a sink to catch the liquid that comes out from the courgettes. 2. Meanwhile in a bowl combine the onion, garlic, flour, eggs, lemon, the herbs and cumin. 3. Using a peeler, strip back the asparagus into long, thin strips and set aside. 4. Put the grated courgette into a clean tea towel and squeeze out as much liquid as possible before adding to the egg and flour mix. Give this a stir and a large pinch of salt. 5. For the whipped feta, place the feta and the lemon juice into a blender and blend until smooth. You may have to add a touch of milk to help make this happen. 6. To finish, heat a frying pan with oil. Add half tablespoon sized scoops of the courgette mix to the hot pan. Flatten them down slightly using the back of the spoon and cook until golden brown on both sides and cooked through. 7. In a separate pan, melt the butter until it gives off a nutty smell. Toss in the asparagus, dress with the butter, season with sea salt. 8. 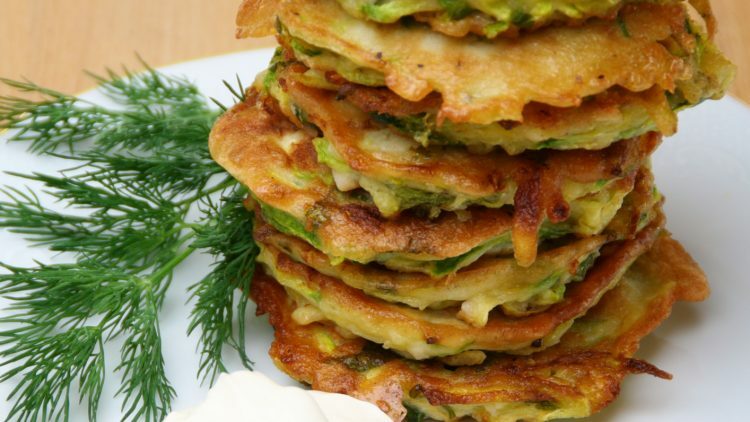 Serve the fritters topped with the whipped feta and the warmed asparagus on the side.